Angola is a country of great contrasts – with bullet-ridden ruins and luxury highrises, excessive wealth for few and extreme poverty for many, and a pervasive hope amidst real desperation. 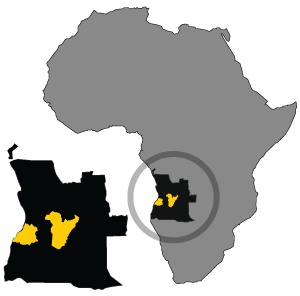 Located in southwest Africa, Angola is a country rich in natural resources and home to 24.4 million people. It was a Portuguese colony for nearly 500 years, then endured a brutal 27-year civil war which ended in 2002. The conflict left its cities, buildings and infrastructure decimated; its people displaced and suffering, most without access to clean water, healthcare and education. Born and raised in Angola, Andrew Cole returned with his father in 1997, for what he thought would be a one-time visit. Witnessing the impact of war on children, and wanting to help, Andrew envisioned rebuilding a school in Chilonda, where he had grown up. Joined by a group of passionate people, RISE International was founded. They believed that education would be the driving force behind a strong economy and key to breaking cycles of poverty and despair. RISE developed a simple plan: Build primary schools in rural Angola to educate children, empower communities and contribute to the rebuilding of the country. RISE currently focuses its efforts in the Bie and Benguela Provinces (highlighted) and has built schools in Luanda, Huila, Huambo and Cuando Cubango Provinces.